Our team answers homeowner questions every weekend on WCCO 830 AM from 9:00 am-10:00 am. Have your most pressing home improvement questions answered by calling 651-989-9226 or texting 81807. Here’s must-know information from our in-house deck specialist, Luke Panek, shared on 3.16.19. One of the most invigorating parts about being Twin Cities deck builders is that trends are continuously evolving. Within the past decade, there’s been a transition from cedar and treated wood decks to composite deck designs. When composite decking products were first introduced to the marketplace, they were largely experimental, but they quickly earned mainstream approval because of the limited maintenance needed to keep them looking their best. Early spring is an optimum time to plan out your composite deck building project with a reputable contractor because oftentimes they still have room on their schedules. Waiting until the summer or fall months often postpones the project until the following year. Early spring can also be an ideal time for insulation contractors to evaluate the effectiveness of your house’s attic insulation. This is because the interior temperature of a home varies widely from the outdoor temperature, making it easier to spot air leaks with infrared imaging. It’s wise to get multiple estimates to ensure that you’re confident in the contractor you’re working with and their suggested course of action, as proper insulation techniques depend heavily on your home’s architecture. Steer clear of any contractor that suggests a more comfortable home can be achieved though attic insulation alone, as attic air sealing and ventilation adjustments are often also necessary. The application of spray foam insulation works well in many cases, including crawl spaces and story and a half homes with attics that do not contain living space. 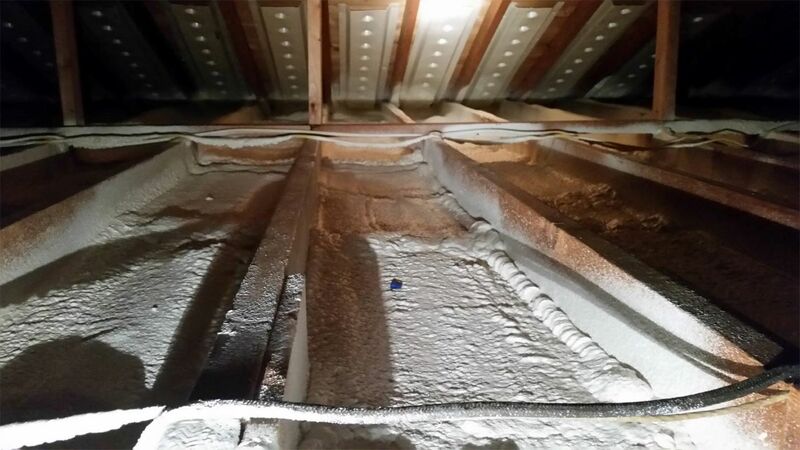 For attics that are separated by dwelling spaces, it’s wise to begin by removing the preexisting insulation and then spray foam the roof deck from the inside, as these spaces rarely vent well. These spaces are tricky to insulate because they lack sizable overhangs, preventing you from being able to get the necessary R-value through other methods. Spraying two inches of foam on the roof deck prior to installing a metal roof offers a decades long solution to ice dams. "I had you guys insulate, install SeasonGuard windows, gutters, 2 bath fans, renew deck railings, wrap and steel side the house. I got my bill from CenterPoint, and find it interesting that I use 10 percent less gas than my efficient neighbors. I guess they really aren't that efficient! Thanks Lindus!" - Alan M.